Bali-based Amina Ghazi shares thoughts on one of the island’s sensitive taboos. The fossil fuel industry is taking hold of local culture and offering the paradise little in the way of a sustainable future. Since 2010, the Bali Tourism Association has said that traffic congestion on the island must be addressed. Both the government and the private sector have agreed that solutions would be created through better planning, regulations and maintenance. If that sounds familiar it’s because this is the answer used all over the world. Traffic congestion and its inherent pollution is a problem in every country. The USA has good planning, regulations and maintenance and has expanded the auto-based infrastructure as the population grows and more cars are on the road. Yet, just go to Google Earth and look at San Diego’s eight-lane freeways in gridlock. The fossil-fuel-driven automobile is the greatest weapon of mass destruction and rampant greed in the world. If we do not implement radical changes in transportation, we will all continue living in the pollution and darkness of the fuel-driven industrial age. The solutions are all here. Cars can run on hydrogen energy. Electric and solar cars have been developed along with advanced solutions for public transportation. Why are they not considered or implemented? Why has the term ‘transportation alternatives’ become radicalized and scoffed at? Why does New York City only allow one car-free day for Manhattan, a rock island seven miles long and two miles wide? The same reason we have not been urged to consider even simple alternatives such as bikes in most developed nations until recently. Transportation today is a vehicle of dominance by the fossil fuel industry. Strange when one considers the fact that one of the first cars Henry Ford made was largely from hemp and could run on hemp oil. The first model T cars ran on ethanol. Farmers could make ethanol in stills right on their farms using crops they had grown. We were taught that prohibition of alcohol in the 1930s in America was simply about stopping the general public from consuming alcohol. The law was enacted at the same time the combustion engine was deemed to be more effective when run on fossil fuels. Prohibition ended when there were petrol stations put in place all over the country and all cars ran on gas, and public transportation such as streetcars had been removed from most cities. Smart cities refused and, like New York, enjoy excellent public transportation via trains and subways. I used to have a vision that emerging nations such as Indonesia would learn from the mistakes of the West. That they would not demand the same routes to development causing devastation to their ecosystems. I hoped countries such as Indonesia would focus on keeping infrastructure such as the banjars here in Bali and leap right into high tech solutions to preserve their identities and lead the world into a new way of living. I’d thought community-driven programmes could improve the quality of life by implementing enterprises of development that are sustainable. Many years ago, Bali changed a westerner’s view of life. The simple but satisfying quality of life, the respect for all nature, the reality that a good life could be enjoyed without chasing financial primacy. Until the late 1980s, there were more trucks for transporting goods than cars. Bicycles were popular, but most Balinese walked or took a Bemo. Now it seems every Balinese family has a car or access to one. It is considered a necessity, even if one cannot drive. They took easily to the bling of modern consumerist society. The petrol-sucking automobile is at the centre of western culture and Southeast Asians are buying into that material culture at breakneck speed. Like the continued expansion of major hotels and resorts, many funded by World Bank and multibillion-dollar corporations, the virtues of a growth economy were extolled and accepted, despite public outrage. Temples no longer made up the skyline. Balinese never owned their sawahs, passed down through generations. Non-ownership was propagated as a communist ideal and eliminated. Rice paddies, sold or many times borrowed against, began disappearing. Food is now an expensive commodity. Credit is how to buy things. Everyone has to work and that means getting to work. The nine-to-five ideal is embraced to a fault so garbage trucks do pickups during the day, usually during high-traffic times. The streets accommodate one lane but are used for two lanes – just drive down the white line. Drunken tourists rent bikes they don’t know how to drive. There is no consciousness of ‘right of way’ (pedestrians first, bicycles second, merging into traffic, etc.). People can drive their gas-guzzling vehicles any way they want. When a young Korean tourist fell off her bike and was run over by a speeding dirt bike, the news did not mention the driver’s name and said he was not apprehended because he had no insurance and no money. Only now are new rules being put in place. These include a Rp.10 million fine or ten years in prison for bribery. But none of this will change the fact that there are too many cars, especially taxis. Here are some Band-Aid solutions using south Bali as an example. Taxi stands must be set up to stop the shocking number of taxis that routinely prowl. During peak traffic, there are four to six taxis to every privately driven car, and most are empty. They speed up when they have a customer then slow to a crawl, annoying tourists by honking or stopping to harass them for a fare. First-time arrivals always mention how they feel barraged by drivers bartering for passengers. Welcome to Bali. Parking lots are essential and there are few. Cars double-park, stopping traffic, and are never ticketed. There is nowhere to park or even pull over, which doesn’t stop drivers from doing so and creating chaos. Delivery trucks and garbage pickups should follow the lead of organized towns with proper traffic laws (do your deliveries at night). Garbage pickup is only allowed between the hours of 1 am and 7 am. All over the western world, garbage is picked up in the early hours of the morning. Not every kind of work is nine-to-five. This is another convenient misconception of auto deliveries. High fines or community service should be imposed for breaking these laws. Here is a novel idea. Impose fines and restrictions for drunk driving and enforce them. The streets are filled with wasted tourists – and a few locals – after dark who drive at top speed, totally out of control, then write on social media how Bali is at fault. If stupid actions are illegal in your country, do not come here and act stupid because you think there won’t be consequences. Bali has been actively seeking solutions since 2010, but little has changed apart from better road maintenance, which has greatly improved at the cost of the entire sawah system. There go sustainable communities. Solutions are being presented in venues such as the 18th International Conference on Traffic and Transportation Psychology. They presented complicated studies such as “The Economic Value of Time Spent in Traffic.” These studies many times use ‘engineering mathematics’ to study solutions constructed by ants adapting to a similar traffic flow environment. These solutions that are static and ideal do not accord with realistic applications. There has been a multitude of studies and unrealistic answers. Recently in Bali, they made a large number of streets go one-way, with a computerized example of how it would improve traffic flow. It did not work. It created chaos. Bali needs to go high tech and be receptive to real alternatives that will thrive and continue to serve the next generation. China has an electric bus system where the bus moves at the top of an arch over existing roads – safe, simple and solar energized. It makes no sound and runs on time. 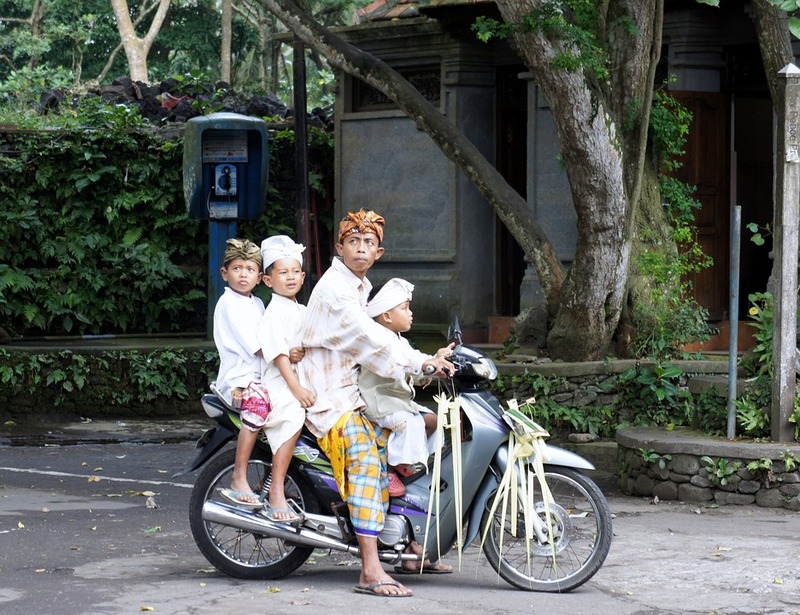 Imagine having a smooth ride up to Ubud. One may bring a bike to use at one’s destination. Perhaps a bike made of bamboo, which two people (expats) are already making. Soon, they will have an electric bamboo bike available. Sadly, however, Indonesia is following the West and relying on whoring its resources to other countries such as America, and now happily taking development money from their Saudi visitors in exchange for ‘partnerships’ in the fossil fuel industry and getting the quota for haj travel to Mecca raised to over 200,000 visitors for this year. Only the very wealthy can afford to do so, but aren’t all good citizens happy to keep the top 2 percent in the manner they are accustomed to? That is possibly why ‘transportation alternative’ is a distasteful term politically and in developed societies. Our worldwide reliance on fossil fuels is at the core of transportation chaos happening globally. We have the solutions, and by not implementing them, we are doomed. It is a minute before midnight, and in places like America, oil is valued over water. I hope Indonesia realizes it can do better. I hope this emerging nation can recognize the wisdom of its indigenous cultures in holding nature sacred. Fossil fuels do not sustain life. Water is life – and it can even run your car.